View this article in the digital edition. In the 2018 SBCA Safety Survey, component manufacturers (CMs) were asked which leading indicators they were currently tracking. Everything from housekeeping and safety meetings to employee audits and near-misses were on the list. But even if you’re tracking them, the key to incremental improvement is following through on these numbers with targeted action. “My philosophy,” Jason explains, “is that we produce components as fast as is safely possible. Safety and production have to go hand in hand.” Even one incident can have a dramatic impact on production efficiency when it shuts down a line or pulls multiple employees away to tend to an injury. If you’re collecting data, and it’s telling you that you’re going to have a problem surrounding a specific leading indicator, do it all: update your policies and procedures, plan some additional training, schedule a safety meeting, and give a toolbox talk. …traditional safety metrics are reactive, bottom-line numbers that can only provide after-the-fact information. They are past accident statistics that are not focused on prevention. Implementing a near-miss program is an easy first step toward a proactive safety culture. All you need is a form to collect the location, date, time and description of the incident. About the Author: Molly Butz searches for industry best practices that can help component manufacturers grow a stronger safety culture throughout their operations. Are You Using This Powerful Tool? Get the Whole Gang Together! Editor's Message: What Will Your Company Do Tomorrow? CM Perspective: We Need You to Attend SBCA Meetings! © Truss Publications, Inc. All rights reserved. 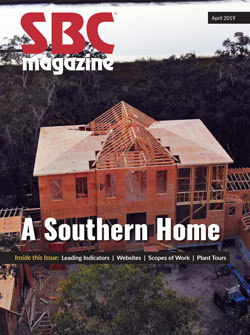 SBC Magazine is a publication of the Structural Building Components Association.